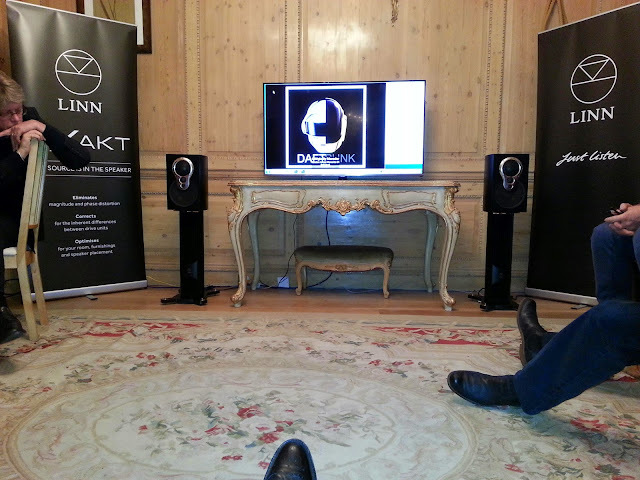 Thanks to Rococo Systems in London, I had the chance to listen to Linn’s new Akudorik Exakt stands and speakers fed from the new Akurate Exakt DSM recently. Here are some musings on the experience. First, the venue. Our hosts Peter and Mary were very welcoming with snacks and a selection of drinks offerered and frequently refreshed. This particular part of Rococo systems is a couple of largish ground floor rooms in a substantial terraced property. Not quite Rococo in style, the fully panelled rooms and deep sofa are welcoming without being pretentious. A wood floor is covered by a very large but thin rug. The speakers sat either side of a table upon which a large tv displayed the Kinsky control app (not Kazoo I noted) including the relevant artwork. The Exakt Cat 5 cables disappeared out of the room to the AEDSM next door. 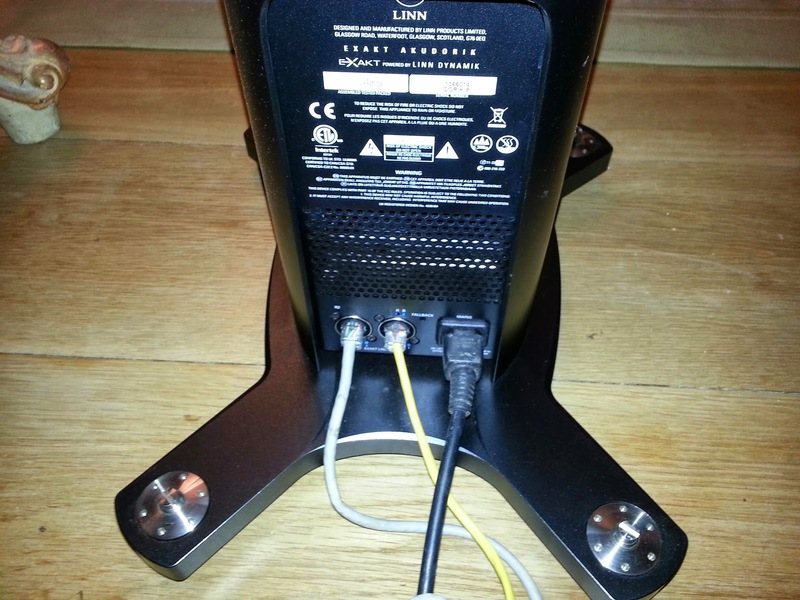 Its quite amazing to think that its now a year since Linn launched their Exakt technology and dome of the earliest pictures (and most accurate descriptions) were published here and plagrised on sites around the World. Linn have gone through many explanations of the tech and are still doing so. From that initial KEDSM / Exakt 350 launch, the tech has been launched in Akubarik, Akurate and Klimax Exaktboxes, Akurate DSM and now addresses speakers such as the Komri, Keltik and 242. Further launches continue apace and the new Akudorik Exakt standmount speaker and the Akudorik Exakt stands (which combine Exakt engine, DACs and power amps suitable for the new speaker and soon to be usable with the older Akurate 212 and Majik 109 speakers) are the latest in the range. A lot of new products in just 12 months. Alan Williams was the evening’s host from Linn. Alan has many years of experience with Linn and has seen many changes and upgrades over the years. As such he’s happy to talk about pretty much anything regarding the company and its products, the industry in general and, of course, the music. With about 10 of us in the room (including a record producer) the event was relaxed and casual. Alan’s clearly presented Exakt many times now and remembers facts such as jitter rates in various products without the use of notes. For some in the room the Exakt technology pitch is a refresher, for others its an opportunity to learn anew. I think it takes most people 2 or 3 runs through to fully understand, some never will understand and some don’t see the need to understand. There was a talk through the basics of keeping everything digital for as long as possible, how phase and timing errors are corrected and how the drive units are measured and tolerances corrected. Then some music. Then an explanation of the room optimisation feature, including showing the graphs of the room modes, then music with and without the room optimisation enabled. So how did this system sound? Well, its not one of those systems that makes you go ‘wow’ the moment you hear it. That’s not necessarily a bad thing as those systems are often something you wouldn’t want to listen to for hours on end. I found it took me a while to settle into the sound. I’m used to floor standing speakers and it takes a while to stop being distracted by the lack of depth and weight to the sound. This was especially the case with ‘Georgio by Moroder’ by Daft Punk, but what is there was driving along very well and the fairly complex bass line carried the boogie factor well. Simpler music such as The Beatles in 24bit was stunningly good – real insight into the sound of the instuments and nuances in the voices. Until now, I’ve been sceptical of the benefit of those releases, but now I’ve heard it I’m going to have to invest. Metallica, also in 24 bit, was a revelation to those who haven’t heard this before. Clarity and separation benefits heavy metal too. 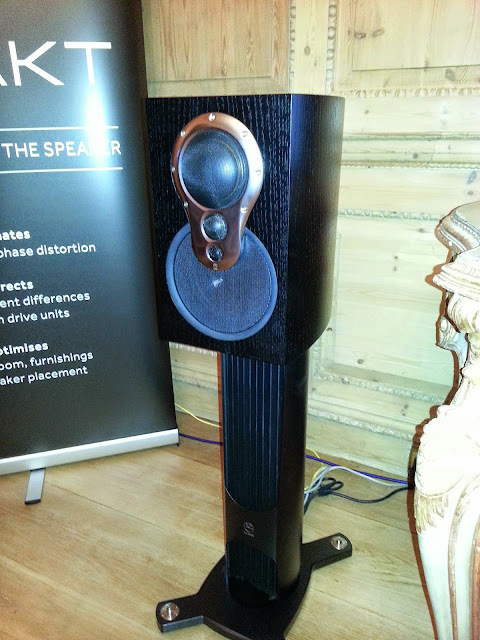 Some baroque orchestral with organ showed that Linn haven’t broken the laws of physics and the sheer scale and majesty of this kind of performance is still restricted with this pair of standmounts. Vocals are very sweet and easy to follow, demonstrated with some Loudon Wainwright and London Grammar. The sophistication of cymbal work on Blues Company’s Dark Day was rendered very well indeed. The verdict? If you like standmounts (or your living accommodation and/or neighbours dictate them) then this combination of AEDSM and Exakt Akudorik will be worth a listen. Sophisticated, musical, easy to enjoy over a long listening session. However, for me, there’s too much of a compromise. For not a huge %age extra cost, a Linn streamer with non-Exakt Akubarik floorstanders will fill that gap in pretty much the same footprint to bring scale and additional ‘all enveloping’ soundscapes. Or wait for the possibility of an Exakt enabled subwoofer and see how that pans out in support of the Akudorik. I think I would prefer the wider range sound offered by the non-Exakt floorstanders over the greater apparent accuracy of the Exakt Akudoriks. Thanks again to Alan, Peter and Mary at Rococo and Linn. 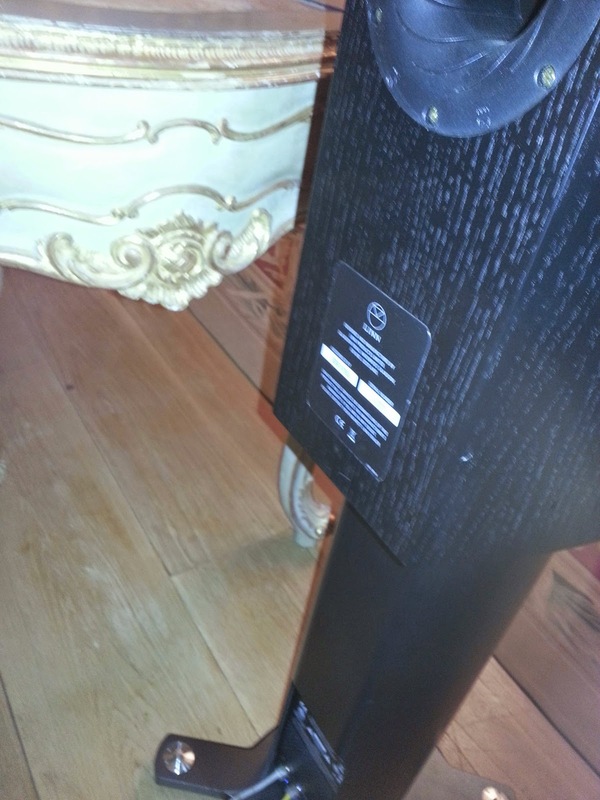 I believe the speakers will now be back in their normal home playing in the local pub near Epping Forest. Might be worth seeking out for a pint and a few tunes!